As summarised in the Kingdom section in the Management tab, each location in your kingdom has an associated cost in maintenance . This cost depends on the number of soldiers stationed at each location. There is also a level of Trade , which will either be positive or negative, depending on how well you manage it. You will find that after conquering a new location, Trade will be negative. The further a location is from your capital, the larger the trade deficit will be. You can move troops to a location in order to revitalise trade. If you do nothing to revitalise it, trade will continue to decline and you may risk becoming bankrupt. Trade can also stabilise , but be careful as it will collapse if you fail to properly defend your village. 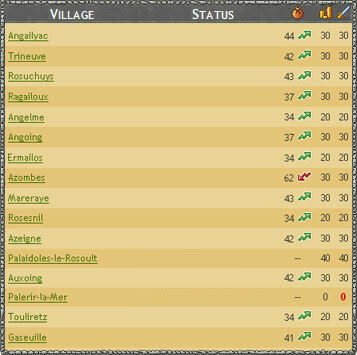 You can view the trade value of each location by hovering your mouse over the trade icon in the Kingdom tab. A good level of trade will enable you to command powerful armies. Bankruptcy : if your stocks of gold are empty, you may find that your soldiers start to desert you. Not only that, but you also risk losing territories if your trade is in a bad state. However, this can sometimes prove useful if you are actively trying to rid yourself of a location.